Sailthru Mobile helps you engage your mobile app users with rich and creative messages. 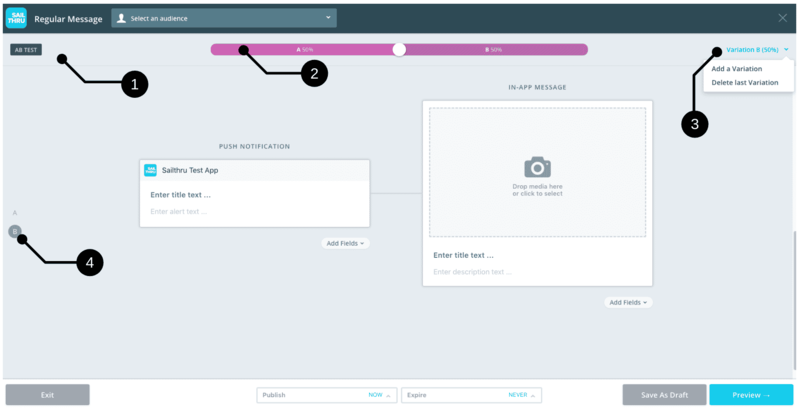 Create Push Notifications or In-App Messages, and allow users to browse past messages in your In-App Message Stream. Sent to users’ mobile devices, even if your app isn’t open. A push notification can be a simple message directing users to your app, or can drive to an in-app message when the push is tapped. The most impactful way to engage your users while they are using your app. In-App Messages are commonly displayed as a “roll-down” interface and can be triggered at key moments, such as the user opening the app. A list of historical cards integrated directly into the app. This is a great way for users to look back over the messages that you have sent to them in the past. Users can access the stream via the “Messages” icon which is integrated into the app, or tapping ‘View all Messages’ on an In-App Message. Whether you want to publish just an In-App Message, just a Push Notification, or both in conjunction, start by clicking Messages in the Sailthru Mobile navigation menu. Click Create New at the top of the page. You will have the option to create either a Regular Message or an Automated Message. Regular Messages Publish messages to all users who are currently in an audience. Regular messages can be sent immediately or scheduled for a future date. Some common uses are to send announcements, breaking news, or deals. Automatically triggering a notification to incentivize a user who hasn’t used the app for a period of time. Sending a notification with contextual information as a user enters or exits a geographical region. A welcome notification for a user a few days after installing. With Automated Messages, an additional option is available to send the message to all current members of the audience, like a Regular Message, and then also to all users who enter the audience in the future, as they enter. In the Messages section of the interface, click Create New. Then, select a message type–Regular or Automated. The Message Compose screen opens. When creating a message, you will choose users to target based on audience segments that you have previously defined. Audiences can be created in the Audiences section. The first thing to do is select your target audience from the Select an audience menu on the top bar. Send on Audience Entry – Publish to users as they enter the selected audience. Send on Audience Entry and to Current Audience – Publish immediately to all users who are currently in the selected audience (as with a Regular Message), and also to additional user who enter this audience in the future, as they enter. Send on Audience Exit – Publish to users as they exit the selected audience. “Send on Audience Entry” is the most common choice. 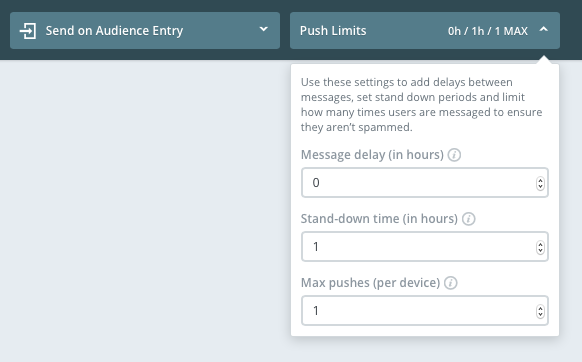 With Automated Messages, you also have frequency capping options under the Push Limits drop-down to limit the number of push notifications that are sent to any single user. This ensures that users are not spammed. Delay the push notification up to 24 hours after the device enters an audience. When the delay period expires, the message will be sent. Specify a stand-down period of up to 24 hours after the initial push has been sent. During the stand-down period, messages are not saved to be sent when the period expires, but are skipped. Essentially, “don’t send more than 1 push notification per hour or X hours per device”. Limit the maximum number of push notifications that a device may receive with this message. Note: If a stand-down delay has been set for a message and a user enters, qualifies for the message, but then exits the audience before the delay passes, they will still be sent the message. For this reason, we recommend keeping stand-downs short so that the push notifications will always be timely and relevant. For example, you set a “custom.last_purchase_category = ‘kids'” filter on an audience, have a triggered message set for on entry, and set a stand-down period of 1 hour. If you change the filter from ‘kids’ to ‘men’ to ‘women’ to ‘kids’ again in less than an hour, only one push notification will be sent, even though the device will enter and exit the audience. 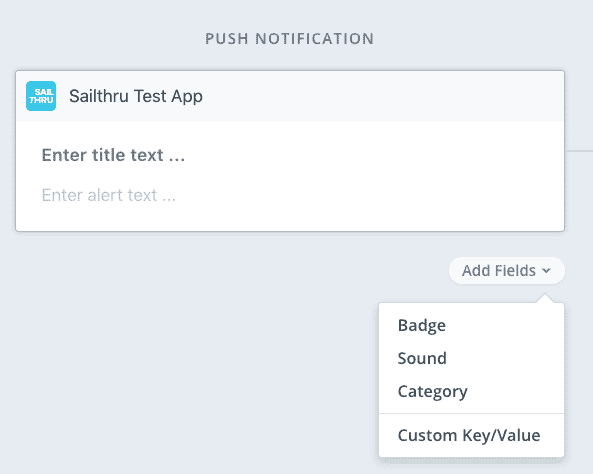 The most common messaging use case in the Sailthru Mobile platform is sending a Push Notification which links to an In-App Message. This drives users to open your app, and when tapped, links to a message with more content. For this reason, the default layout of the composer opens with a Push Notification linked to an In-App Message. There are times where marketers may want to send only a Push Notification or only an In-App Message. If this is the case, you can hover over the unneeded Push Notification or In-App Message and press “x” in the top-right corner to remove it. Push Notifications contain text-only information which will show on screen even if the user does not have the app open. Note: Notification titles are supported on all iOS devices. Notification titles on Android devices are supported from v5.7.0 and up. You can also add extra fields such as a badge, sound, category or Custom Key/Value by clicking Add fields. A Badge will show a small number on the app icon on iOS, which is usually used to indicate to the user that there is new items to view. For example, you would enter 1 in this field to indicate ‘one new message’. If your app contains custom notification sounds, you can enter a Sound file name to determine which sound should accompany this message. A Category can be used to associate custom actions with an iOS notification. Category names are defined when your app is programmed. For more information refer to the Apple Documentation. To enter custom data that your app has been programmed to use or display, select Custom Key/Val. Sailthru Mobile’s In-App Messages allow you to send a wide range of content to your users. You can send videos, images, and links, and add Message Attribute fields that have been custom-configured for your app’s interface. To add a video or image, drag the file into the gray box or click the camera icon to locate a file on your computer. To add a link, click Add fields, select Link, and then enter the URL. See our message and file size/type specifications, for more information. 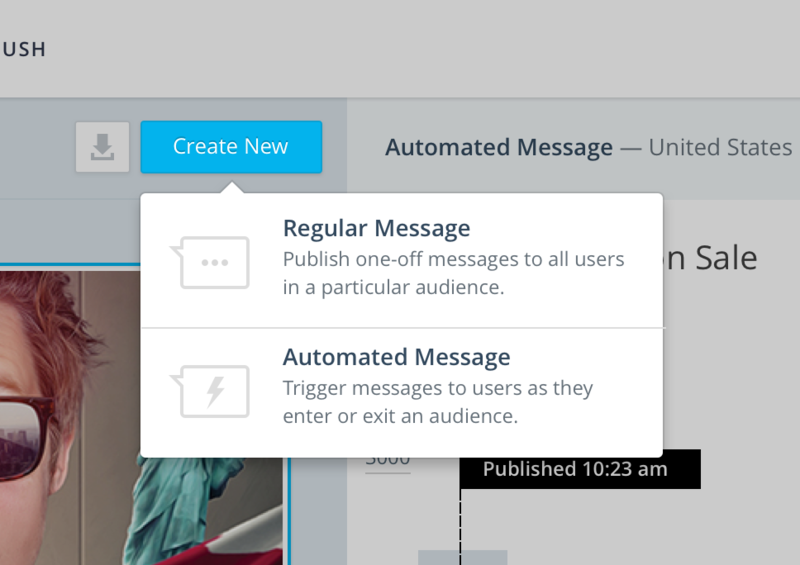 If you want your messages to begin sending immediately on publish, skip this step. Otherwise, to schedule your messages, click the Publish field at the bottom of the interface. Then, select a date and time. You can select a specific time zone, or, if you want your message to send at the specified time when it occurs in each user’s time zone, select Send at local time. When you’re ready to preview your message, click the Preview button at the bottom right. 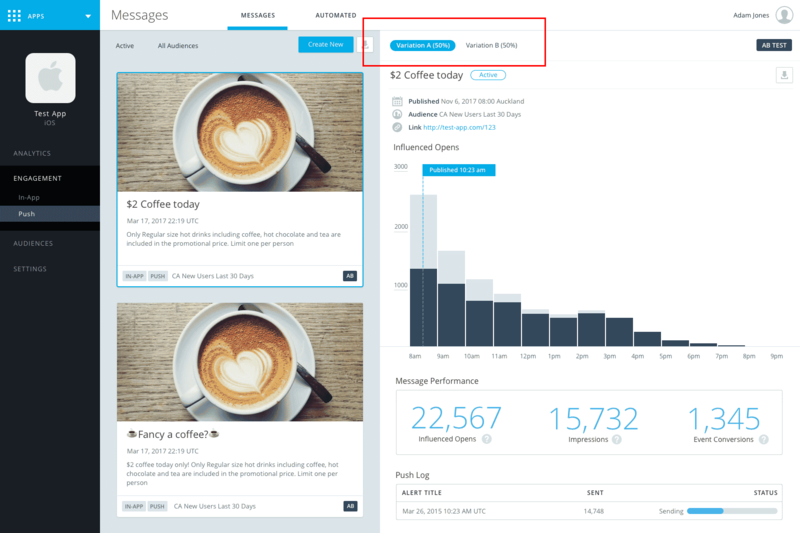 The preview screen will give you an overview of your notifications and In-App Message content, as-well-as any extra fields you have added such as alert, sound, or custom key/values. 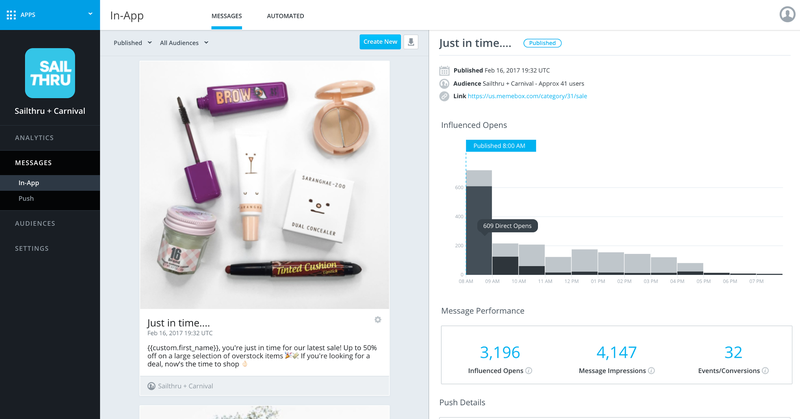 As you hover over the publish menu you can see more details about the audience and timing of your message before you publish. Message Impressions – How many opportunities users have had to view your content. Message Tap-Throughs – How many times the content has been viewed by your users. Size of Audience – An estimate into how many users could see this message. Push Notification Count – How many users the push notification went out to. 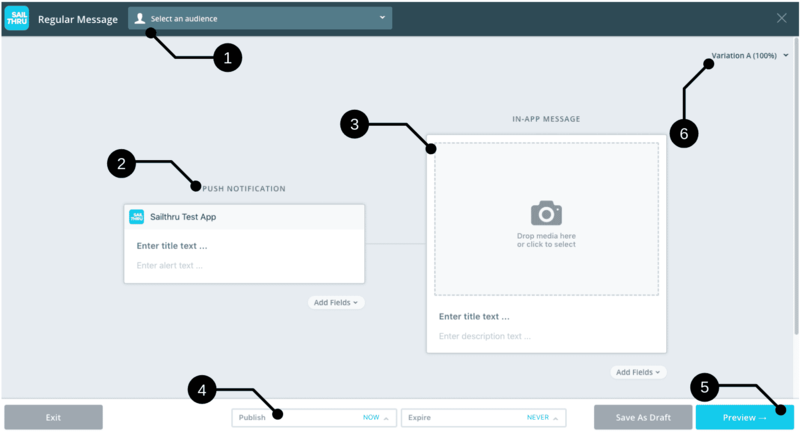 To maximize the response to your messages, you can create and test multiple variations of your push notification or in-app message content for any Regular (Non-Automated) Message. When creating a new message in the Message Composer, at the top-right, click the arrow next to the default Variation A, and click Add a Variation. The Message composer will switch into AB testing mode and display an AB testing toolbar as shown above. Your browser will scroll down to a second variation of your content, Variation B. If you have already entered content in Variation A, it is duplicated in Variation B, where you can easily edit the push notification and/or in-app message content for this variation. You can create additional variations, up to a total of five. At the left edge of the display, click a variation letter to jump back to it. To determine the proportion of your audience that will be randomly selected to receive each variation, use the AB distribution slider at the top of the window. Select an Audience. By default all members of the audience will receive one of the test messages. To isolate the test to a subset of an audience, you can use AB Test Groups. Set your Publish and Expire settings. Click Preview. If any required message fields are not completed, an alert will be displayed on the variation letter at the left edge, and on any applicable field within the variation. Once your preview is displayed, click Publish when you are ready to send or schedule the message. When an AB test message is published it will appear in the messages stream with a small AB icon on the message card. You can switch between each linked variation in the top right hand panel to see which one was the most successful. To compare messages you can check the opens, impressions and event conversions between message variations as per a regular message. AB Testing is a great way to test multiple versions of your messages across your entire audience, however sometimes you may want to exclude some of your audience as a holdout group and only perform the test on some of your users. For example, you may want to perform a test with different variations on 10% of your user base and then proceed to message the remaining 90% with the best performing content. To do this, Sailthru Mobile allows you to set up Test Groups in the audience builder. Test groups are pre-generated deciles of your user base, labeled Group 1-10, that remain consistent for each user. Use the audience builder to create an audience with Test Group “Group 1” selected. 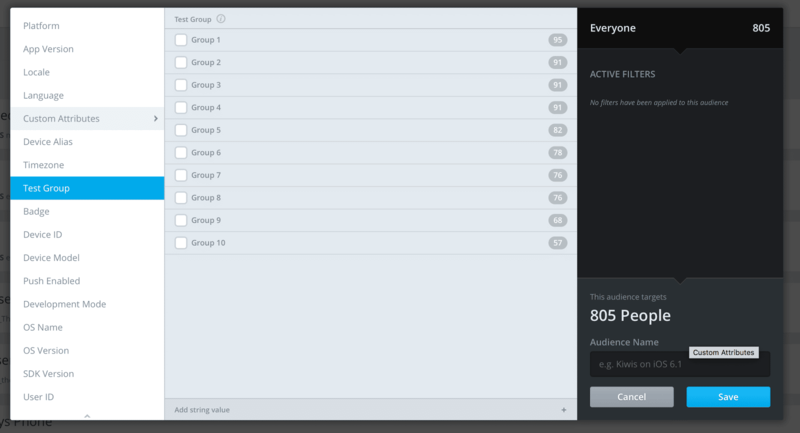 There are 10 test groups, so selecting one will select 10% of your users. You can choose to further restrict the audience using other criteria, like language or locale. Create your AB test messages and send them to this new audience. Send the best copy to users who are part of A/B Test Groups ‘2-10’ as well as any of the additional attributes you selected in step 1.